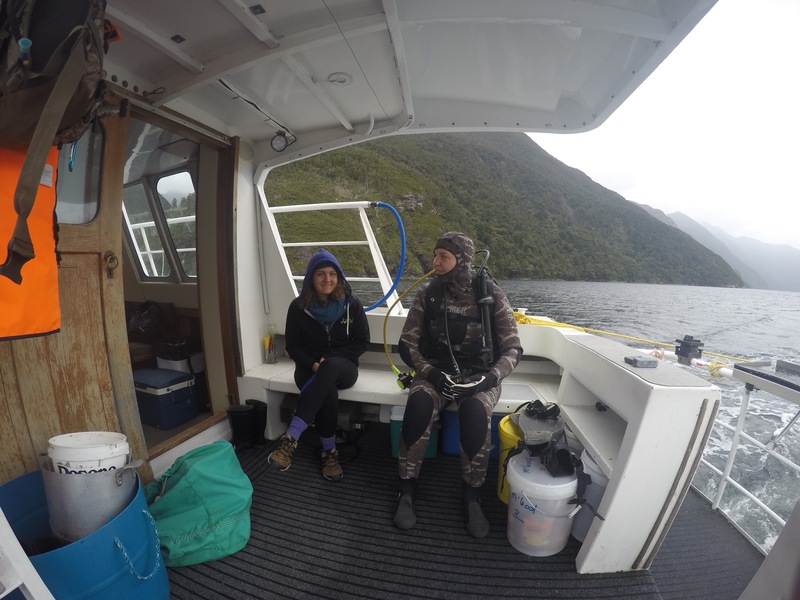 Overloaded with gear and anticipating adventure, Nadia and I headed out of Milford and rejoined reality in Te Anau. 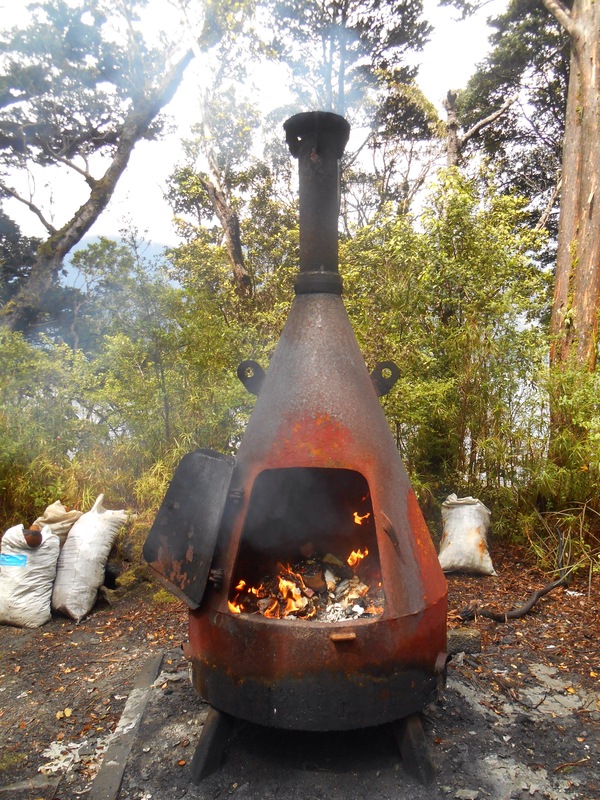 On the agenda was good food, and a night of good music at the Redcliff pub before heading further into the remote, 7 fiords further south of Milford, Doubtful sound. The River jesters kept us dancing until late into the night and after finding our beds for a mere four hours we were woken by the calls to get up and get organised. The journey to this remote place involves a drive to Manapouri, Te Anau’s smaller cousin at around 200 people, an hours journey across Lake Manapouri, a drive from West Arm, home to the amazing feat of engineering, the Manapouri power station, across the Wilmot Pass on sketchy road and down into Deep cove where the Waianiwa was moored. From the high vantage point of the pass, the beautiful fiord opened out infront of us. 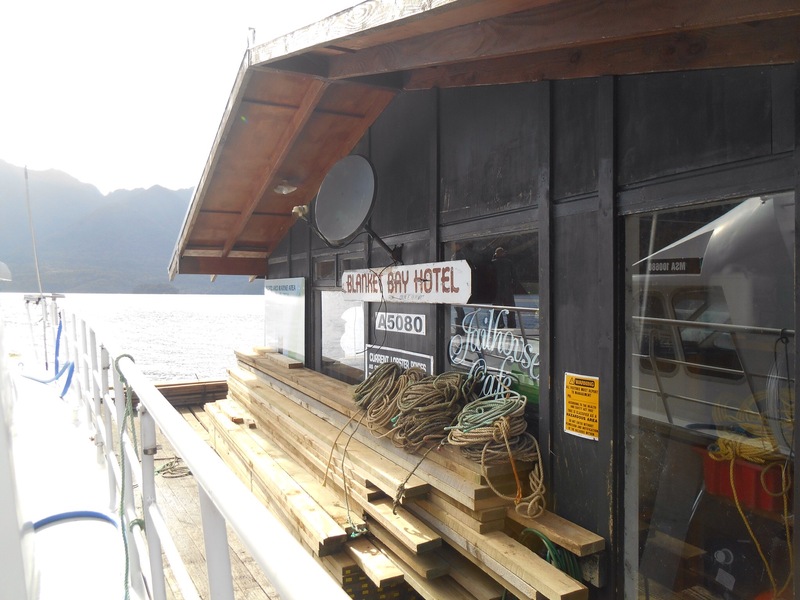 We loaded Waianiwa, meaning rainbow, with goods and headed off out into the sound to begin our 8 days of holiday. 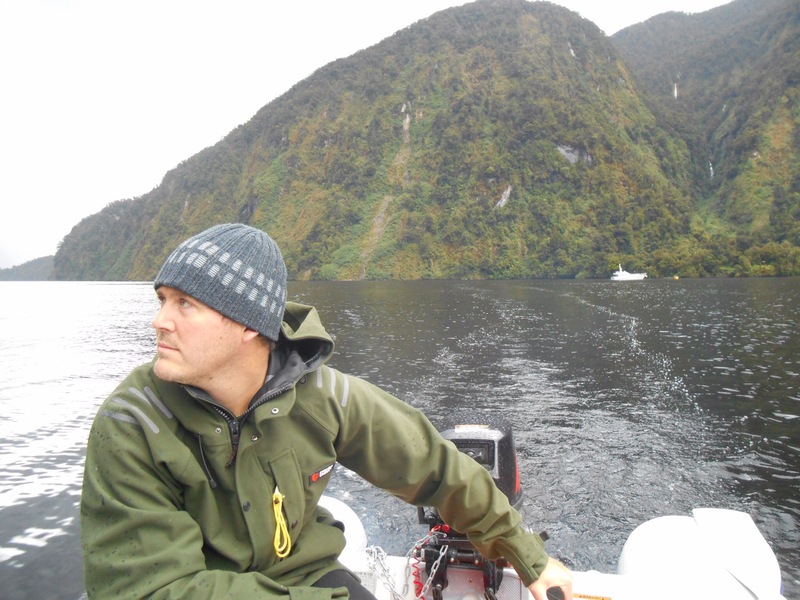 Doubtful sound is so named by Captain Cook and his crew who circumnavigated and charted much of the Fiordland coast. Although they were sure they could get in, they were doubtful they could get out again. It is the only place in New Zealand with Spanish names as it was eventually charted by a spaniard. In honour of those first explorers, I’ll keep a ships log of our adventures. 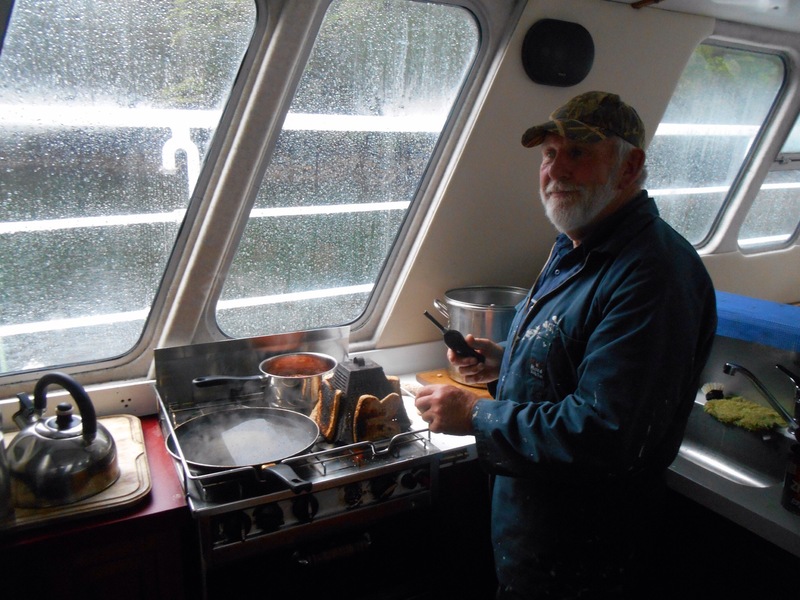 All crew on board and departing Deep Cove Harbour under Captain Keith. Ship crew including Tony, a deserter from the UK, Nadia, deserter from Chicago, Russell of Wellington, Hadleigh of Wellington, Jamie of Invercargill and Lauren, another UK deserter acting as ship scribe. First Impressions of the landscape include a weaving network of arms unlike Milford. It is also much wider. The mountains sit noticeably shallower and less steep allowing higher tree growth. Beautiful serenity as lack of boat traffic. 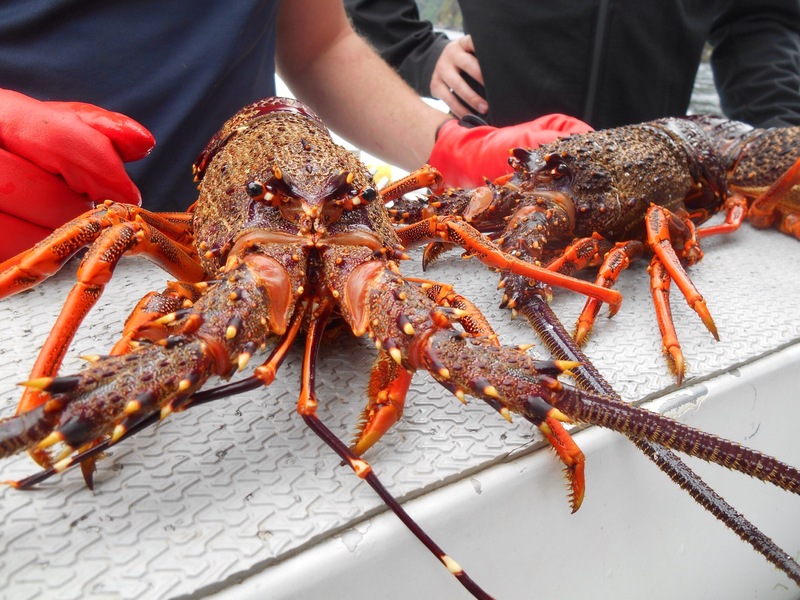 Jamie took first dive for a haul of 12 crayfish. 6 cooked fresh for lunch. Jamie gave demonstration on sizing, sexing and preparing Crayfish. 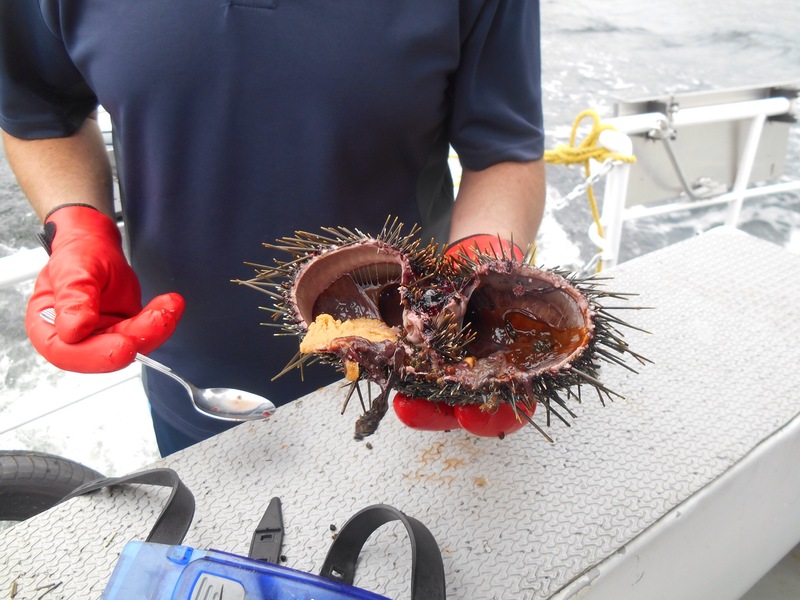 Also caught was one sea urchin (Kina) a Maori delicacy. 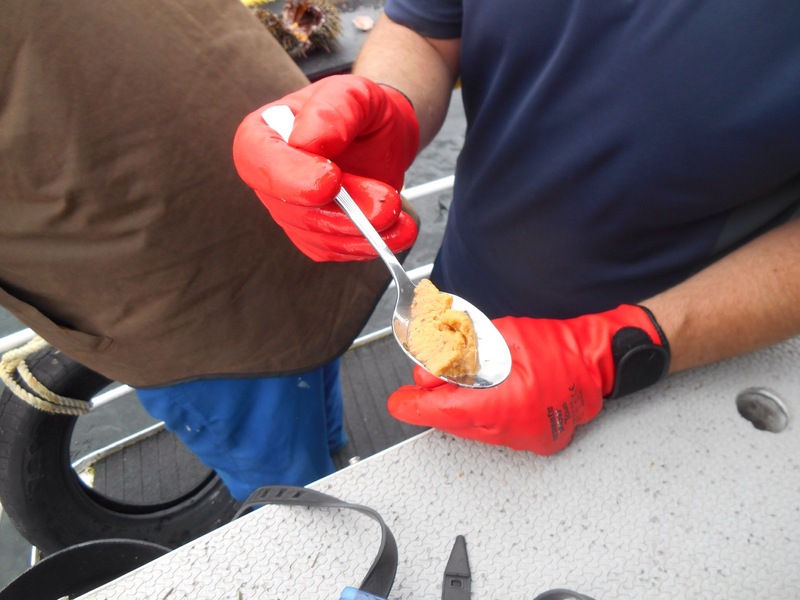 Kina Roe (eggs) sampled by hardy crew members Lauren and Nadia. Crayfish pot pulled to discover 2 carpet sharks inside. Head of Thompson Sound for some fishing. Several Jock Stewart’s caught. 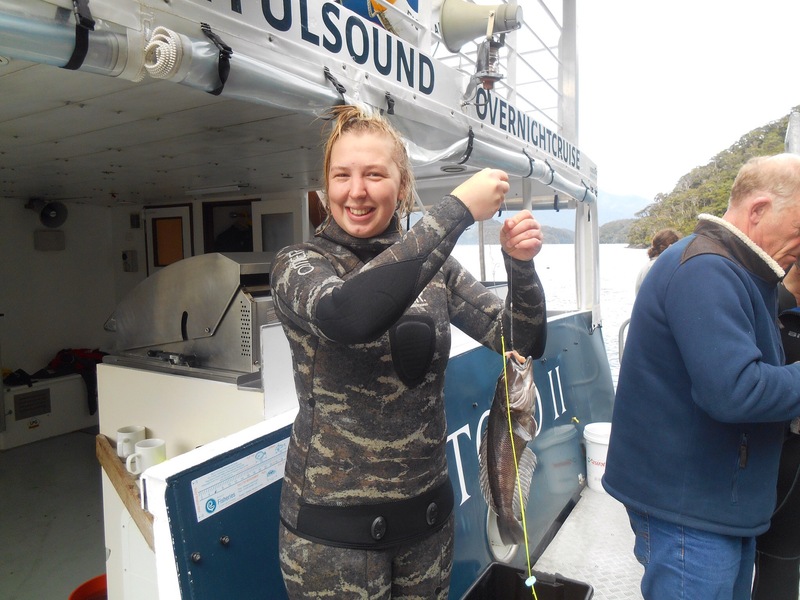 Lauren caught New Zealand several times much to bemusement of other crew. Scuba dive at Hub Creek. After descending through fresh water layer, beautiful clear diving at a balmy 14 degrees. 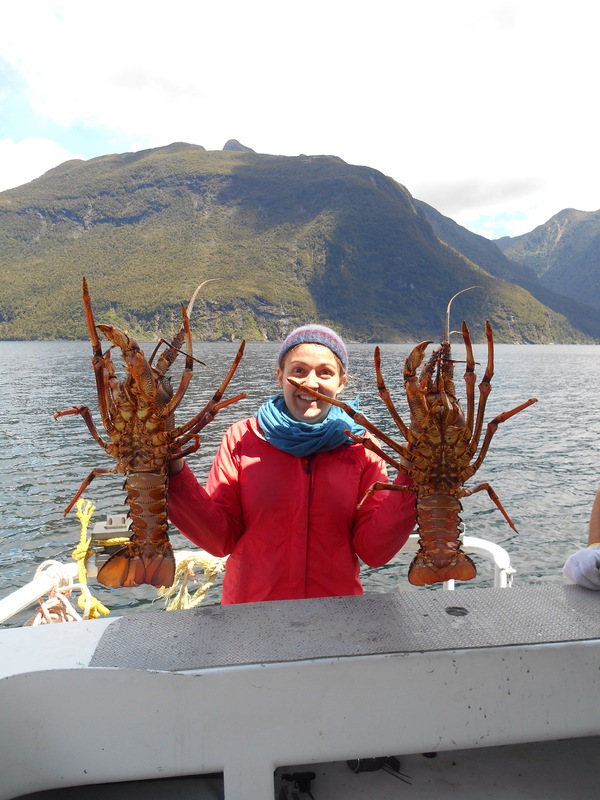 Jamie taught Lauren how to catch spiny crayfish by moving in with the dominant shoulder and grabbing them by the horns. Lauren caught 5 for the catch bag, Jamie several more. Beautiful walls of kelp and a playful seal were noted. 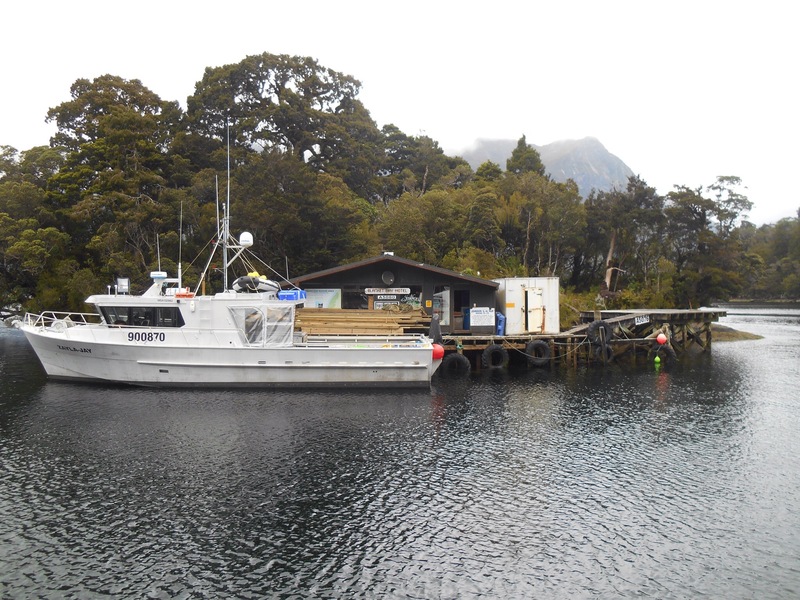 Mooring at Blanket bay where evening duties were handed out and dinner preparations began. Retiring to comfortable cupboard dorms. Keith and Tony in first cupboard, Lauren and Nadia in second, Russell, Hadleigh and room for two more stowaways in front cupboard. Notable other features including two toilets, one with shower, one with bath. Skipper and crew rise for duty. Gearing up for dive one. Lauren and Jamie have separate catch bags and an element of competition is introduced. Crayfish living in one crevice. Competition firmly won for Jamie. Big sea stars, black coral and kelp forests. 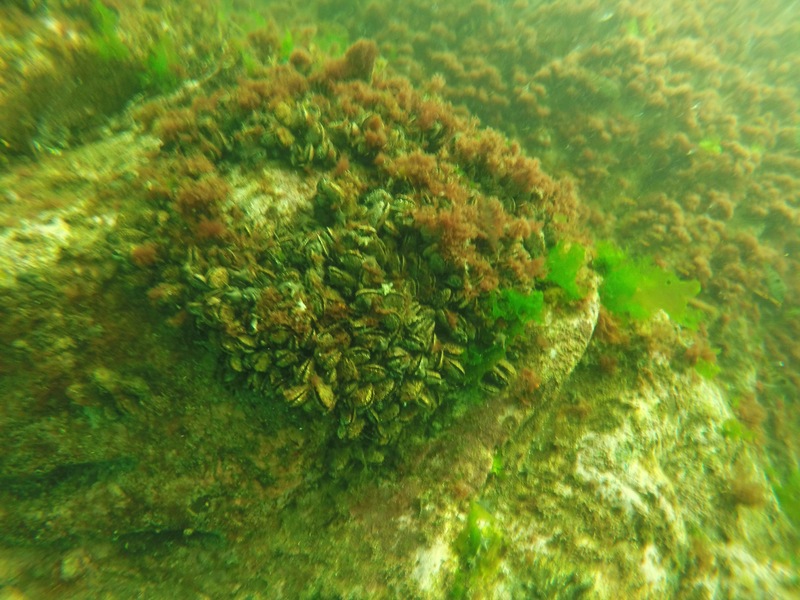 Huge walls of black mussels covered in red and green seaweed, some harvested for lunch. Second dive commenced with large carpet shark. Highlights included following a large sea horse on a hunt and Jamie fighting with a huge Crayfish resisting the catch bag. 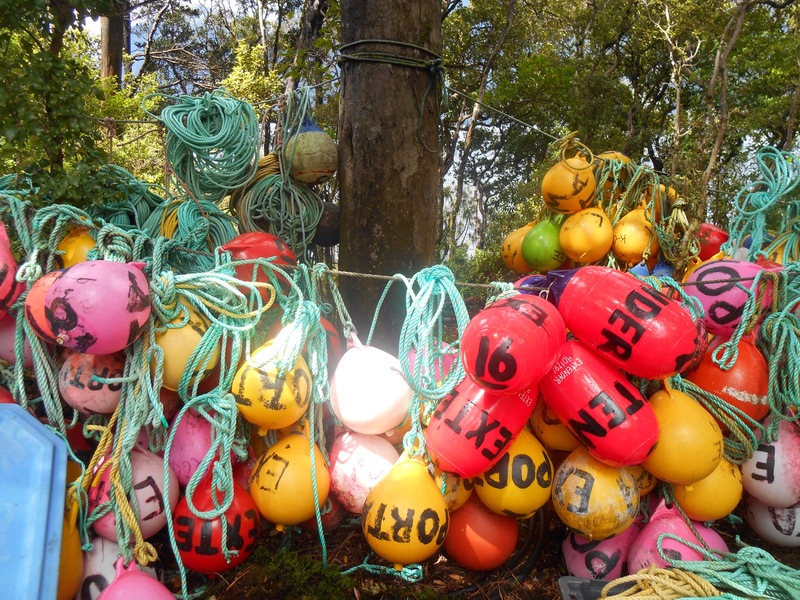 Dive ended at beautiful rock balmy where I snagged three Crays for my catch bag. Seals greeted us at the surface. 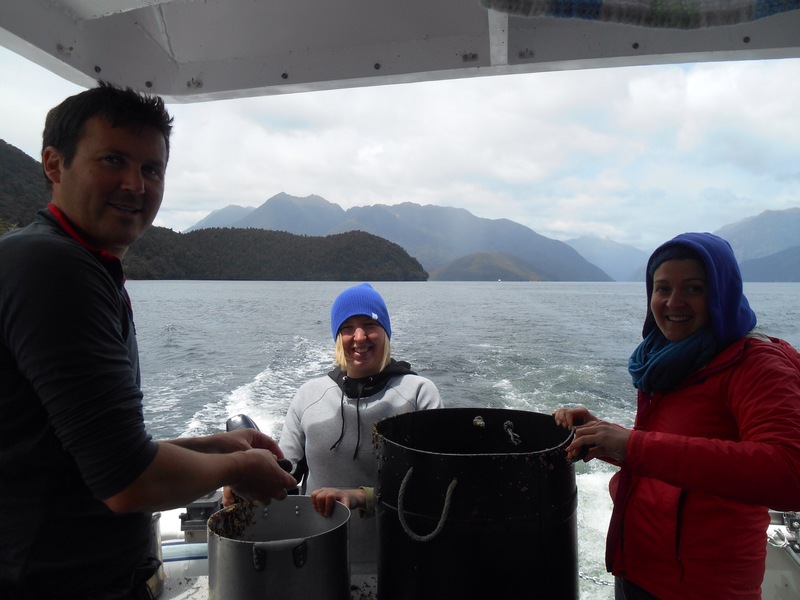 Team begins descaling the black mussels on the back of the boat. 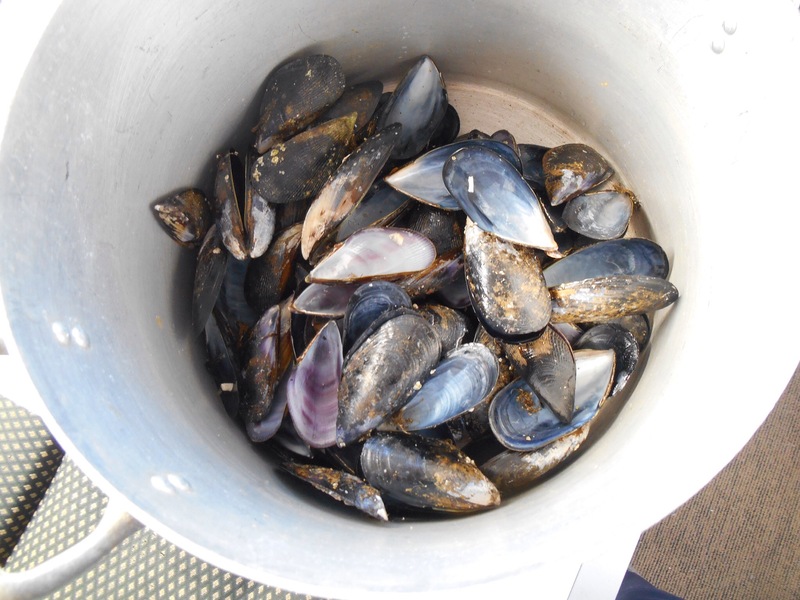 Mussels steamed for lunch. Nadia and Lauren take the dinghy for a row and end up paddling in circles. 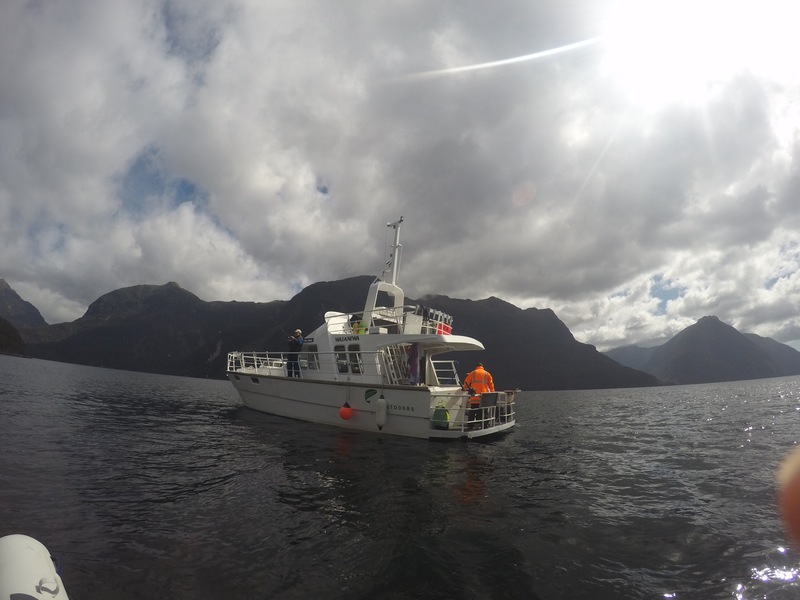 Beautiful panorama opportunities of Doubtful sound. Fishermen take a haul of blue cod. Nadia and Lauren make boat history by completing circuit training regime on the back and top deck of the boat. Dinner served to crew. Debrief of a successful day. Cognac commences story time. Lauren awoken for early dive with Jamie. Successful haul of Crayfish with one clamping Lauren’s hand memorably hard. Begin journey back to Deep cove to refuel and top up with water. Decks scrubbed. Lunch prepared. Nadia and Jamie farewelled for return to work. Fishermen return to fishing stations on bow. Skipper occupied with battling rising winds. Ship scribe checks ships log is up to date (tiring work) and manages to sneak a nap past the crew. 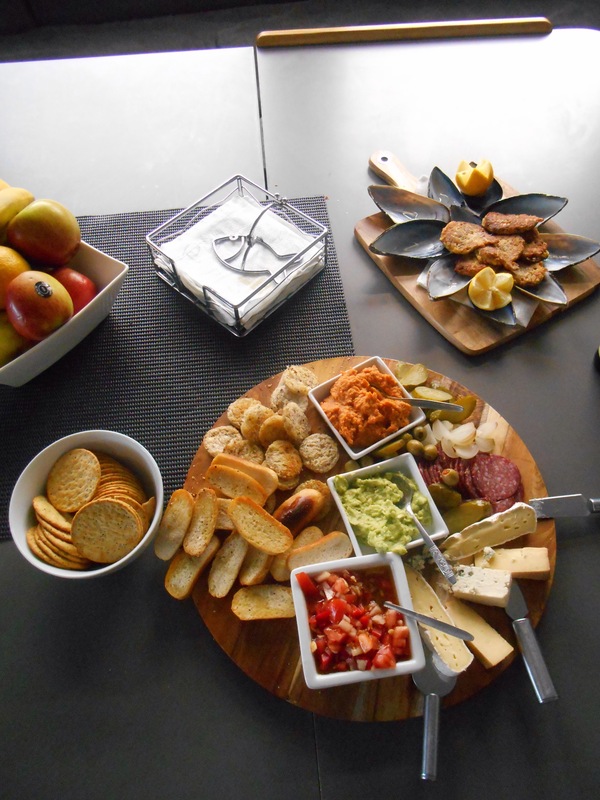 Beers and games precede dinner preparations. 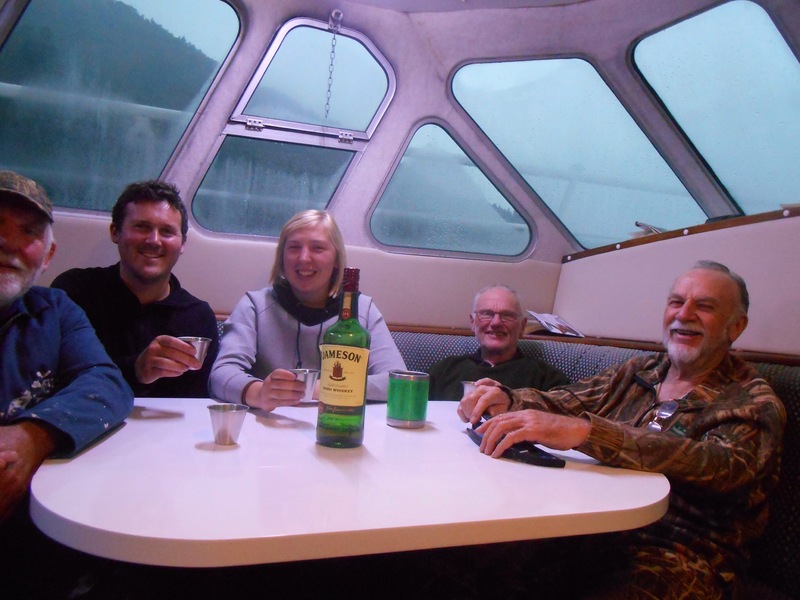 Sea shanties and tales of the ocean. Morning regimes being pushed further back for lazier crew members. Reheating of porridge served with tea. Call in at Blanket bay for water top up. First step on land in four days to complete Wednesday’s circuit training. Chirping birds as spectators. Dolphins visit the crew surfing the bow and peering up inquisitively. 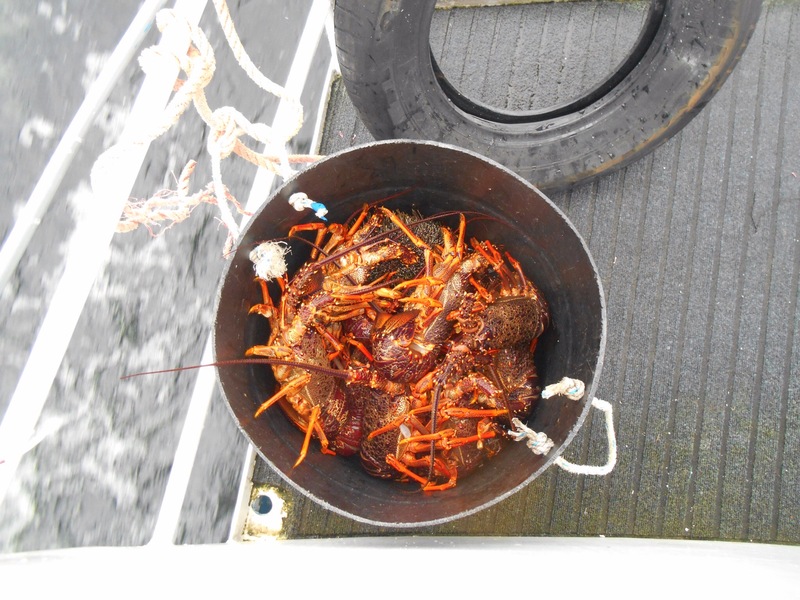 Over to pull the crayfish pot baited two days earlier. 7 crayfish and one confused carpet shark. Pot repaired and thrown back. Crayfish sexed and sized. 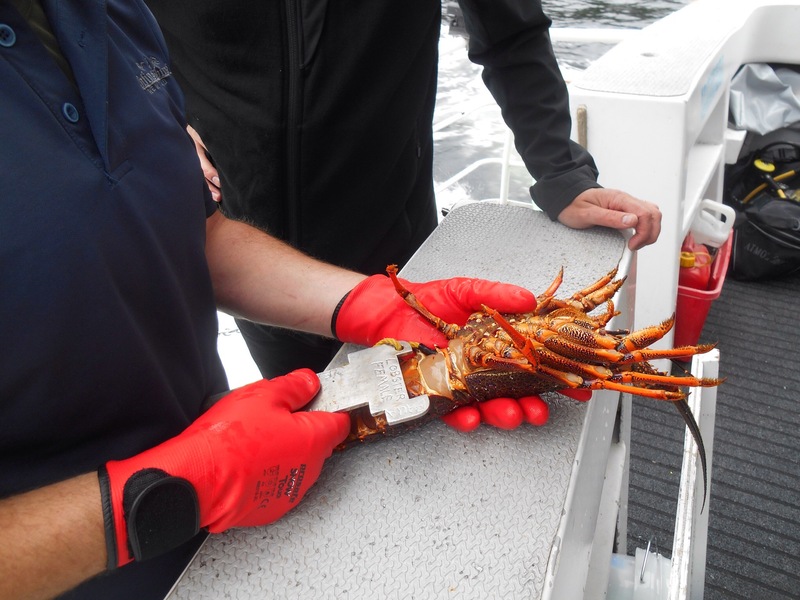 Lauren prepares crayfish for eating by clamping their back, severing poo tube then slicing tail from body in two swift movements. 4 cray tails boiled for lunch and served with salt and pickles. 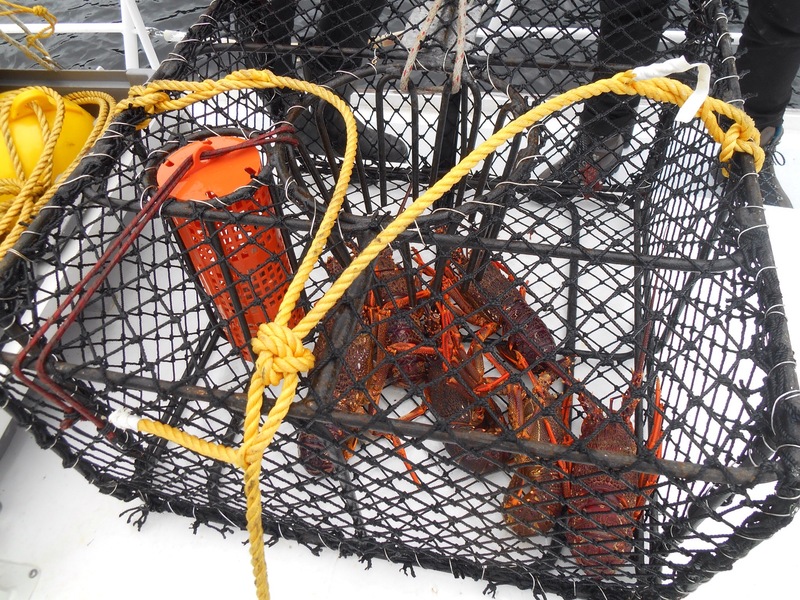 Ocean to the table in 20 minutes. Fishing recommences. 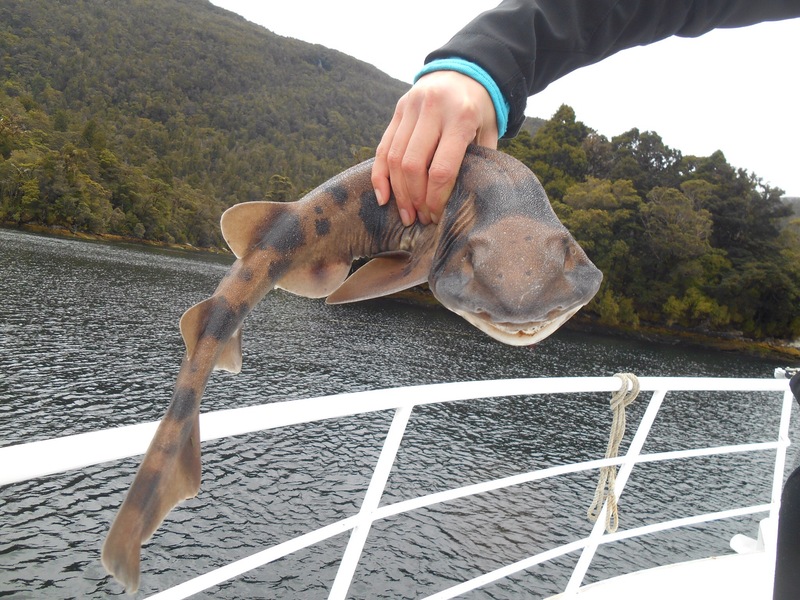 Lauren’s first successful catch was a large spiny dog shark which was cut loose and set free. Keith and Lauren set to work repairing the dive compressor by draining out the old petrol and giving it a clean up. Tanks refilled. Winds picking up and gale warning in force. Return for mooring at sheltered Precipice cove. Wine and crackers served followed by dinner lacking in greens. Must monitor the troops for scurvy. Troops led astray by Lauren who introduces gambling to the deck. Spirits remain high as gusts and thunder prevail outside. Loud burst of hail and thunder allows crew a later start. 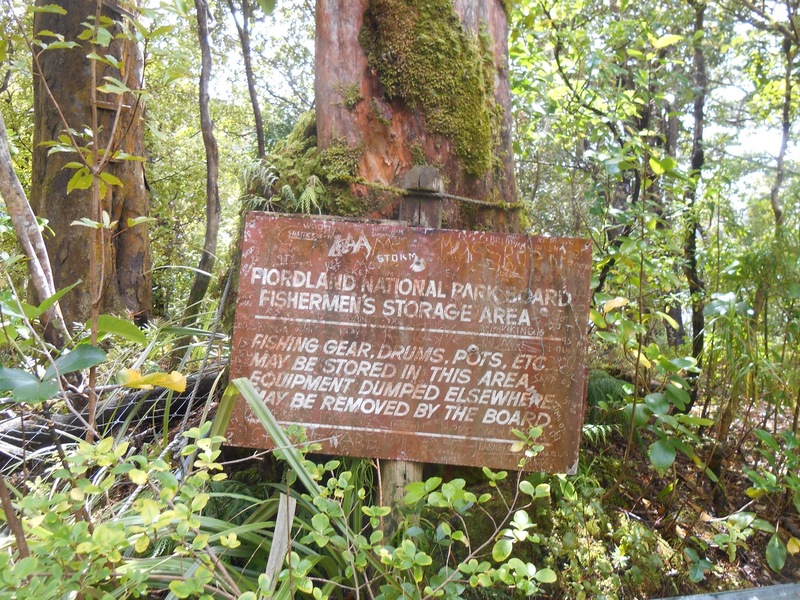 Map of Fiordland analysed, local knowledge imparted to foreigners on the great walking and adventures. Stories of deer hunts exchanged. Keith and Lauren down the hatches to examine the engine room. Orientation of port and starboard engines, exhausts, water pumps. Hole found in grease tube and repaired using hose clamp. Orientation of stern engine and rudder. Stores explored to find a morsel of cake. Shared amongst the crew with tea. Headed out into Thompson sounds, encountered rough seas and retreated to Bradshaw sound, Gaer arm. Small boat released, Lauren and Hadleigh to explore closer to shore, encountered interesting landslip. Took turns to drive the motor boat. A lesson on knots took place on inner deck. Bowline, reef, fishermans, sailors hitch and round turn mastered by the crew. Heavy rains drove Waianiwa to seek calmer waters in Precipice cove. 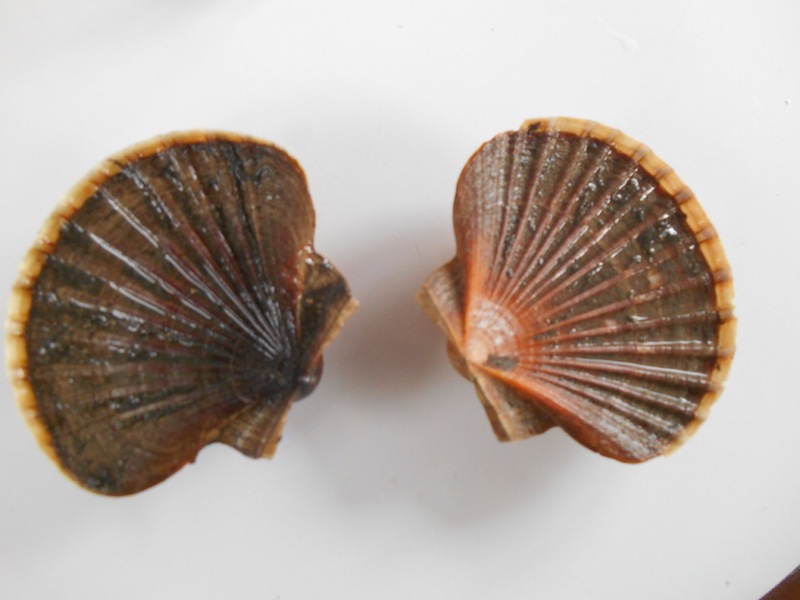 Lauren did first solo scuba dive and collected a huge haul of 2 scallops. Sandy bottom, murky top layer of fresh water, only sea cucumbers and sea stars to report. A creepy experience. Hadleigh ashore to stalk deer. Red wine consumed by the rest of the crew. Fresh battered Blue cod served. Music cranked to the tune of Dancing Queen and The Pogues. Neighbouring fisherman joined for a night cap. 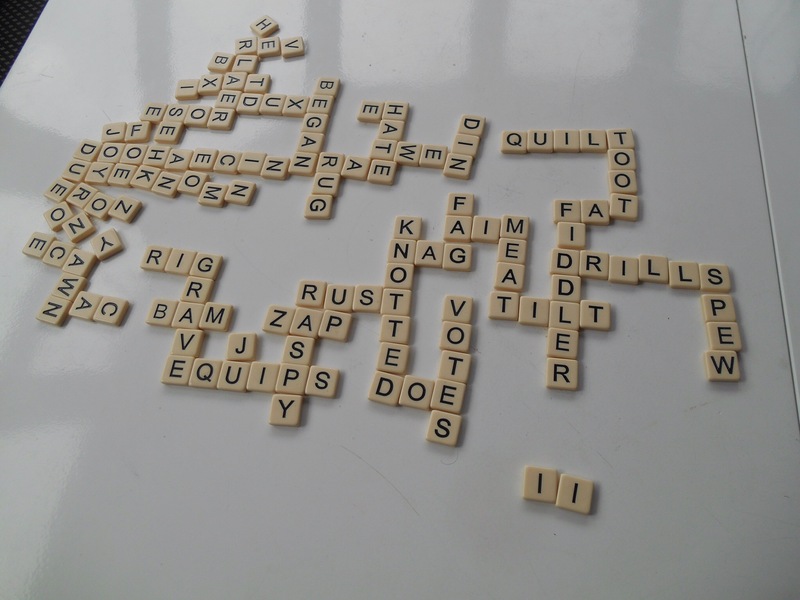 Nightly challenge of Bananagrams and Whisky. Early morning exit to Blanket bay for water refuel. The sky misunderstood the message and thought it was involved. Porridge, tea and the daily look at the four day old weather forecast. Same joke made about the paper delivery. Same joke made about googling it. Crayfish pot pulled. 3 crayfish and an octopus. 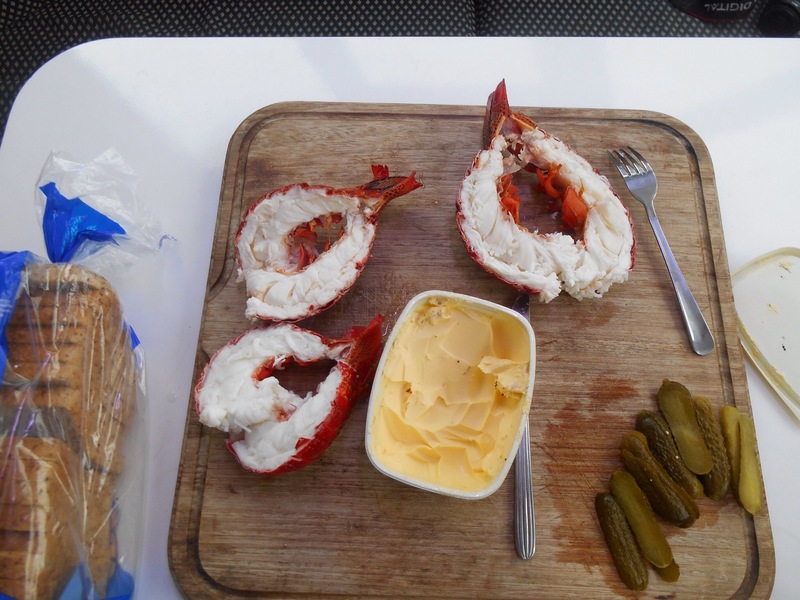 Lauren prepared the crayfish for a million dollar banquet lunch. Fishing stations manned, no catches to report. Solo dive by Lauren. No crayfish caught. Although alone, followed by an army of inquisitive fish. Lauren’s turn at skippering the Waianiwa. Clouds lifting for a promising afternoon. 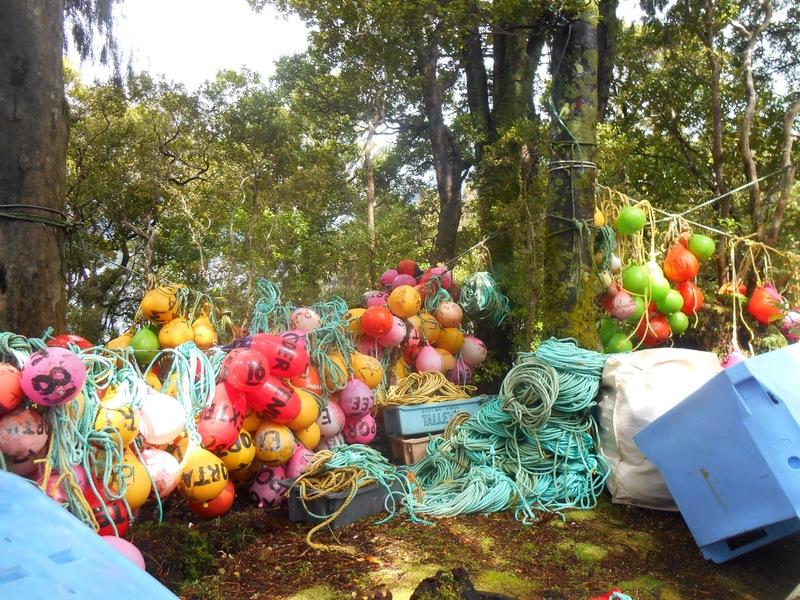 Several large sharks caught and thrown back. Finally some blue cod caught. Mooring for the night in Blanket bay. Head up to crooked arm, narrow, steep sides more reminiscent of Milford. Radio call to Tutuko II. Time off for good behaviour. Andy, one of the crew on the boat on the Tutuko was a friend from Milford. A quick radio conversation and I threw together my dive gear to join them for a dive. 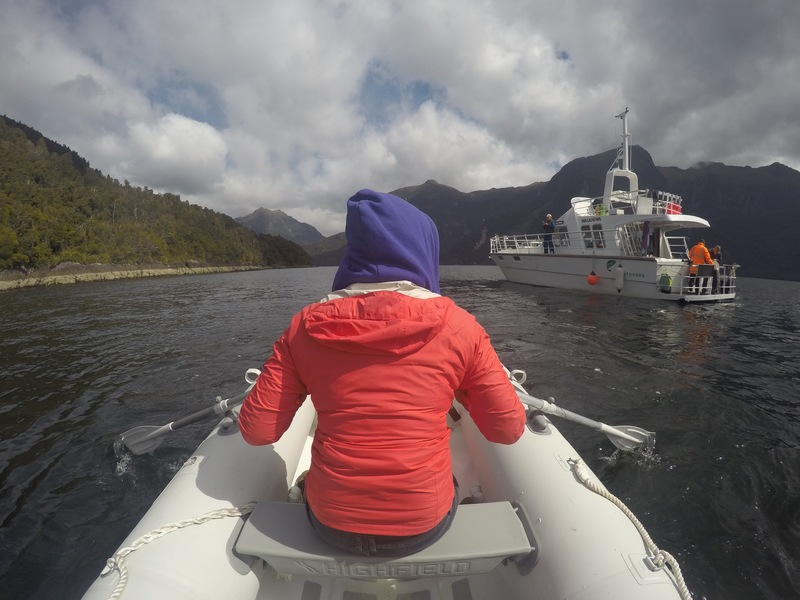 Once on their slightly more sturdy boat we headed down the length of Doubtful sound to the front. There are lots of small islands which make up the front, so we passed through the narrow channel, nicknamed ‘the gut’ and out to shelter Islands, two quaintly names rocks, the ‘hares ears’ and on to the Nee Islands where hundreds of New Zealand Fur Seals slumbered all over the rock, competing for the top spot. Traversing back in we geared up for our dive, to catch crayfish for the customers dinners. It was another beautiful wall dive with lots of green and red coral covering the balmys. 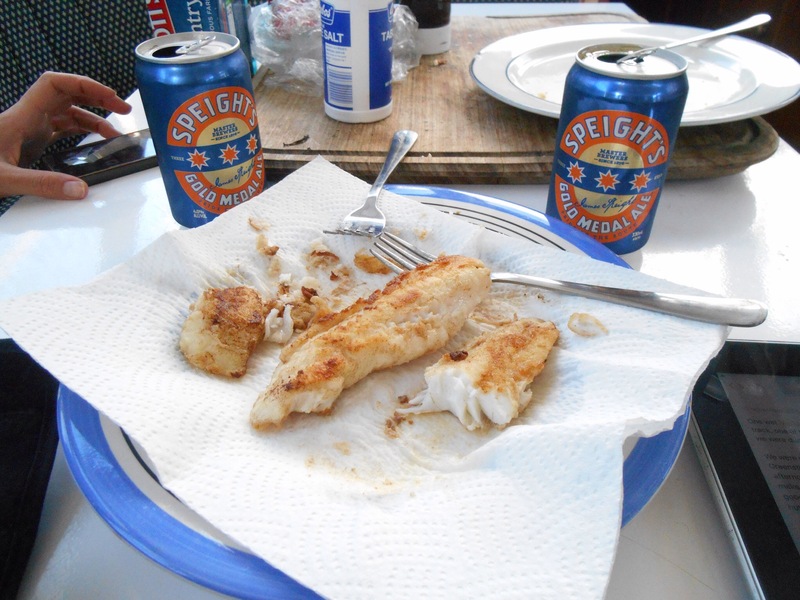 After diving I joined in with the fishing, catching myself a blue cod and 2 sea perch. Fishing is more fun when you actually catch things, I concluded. Once moored in Blanket bay there was the opportunity to take the kayaks out which meant a closer vantage point to the rocks and right up to the waterfalls. Noisy oyster catchers set their territories from invading birds and it was great to see the fiord from such a small and open perspective. Luckily, my crew abandoned me for long enough to let me indulge in a beautiful 4 course meal with the customers before being ferried back to Waianiwa for a night cap before our final night. Heading back to Deep cove. Deep clean the boat, packing, sorting and mooring the boat. Recrossing the Wilmot Pass back to West Arm. Debrief over beer and wedges at a pub in Te Anau. And finally after 8 days, I excitedly steamed back to Milford ready for a punishing 18 day shift, through the festive season and into 2017. Milford felt like civilisation in comparison to remote Doubtful.